Sometimes Hatch takes such good care of you, it’s easy to forget that the Grand Canyon is a remote wilderness area. The remoteness is part of what makes this kind of trip so great, but it does have its drawbacks. If you forget to grab that extra bottle of sunscreen on your way to the beach or find once you’ve gotten there that you need an extra bag of ice, there is usually a gas station not far away. And, if you’re in a car accident on the way to that gas station, emergency responders are sure to get to you quickly. In the middle of the Grand Canyon, though, amenities are not so readily available, and emergencies may be harder to respond to. 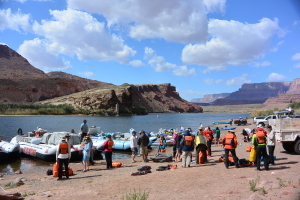 Fortunately, there is a community of people boating on the Colorado River who have your back! Hatch is one of 16 commercial whitewater rafting outfitters operating in the Grand Canyon. Additionally, the National Park Service grants permits to private boaters who are interested in running their own trips down the river. This means that throughout your trip, you’ll be passing other boaters out to enjoy the same beauty, serenity, and adventure that you are. Boats from several companies at Lee’s Ferry preparing to launch. Hatch (like most outfitters and private boaters) works hard to ensure we are good citizens of the river. That means being stewards of the Canyon, looking out for the people around us, sharing resources when we have them to spare, and helping when a situation turns potentially dangerous. Just last year, a number of people who encountered Hatch trips on the river got in touch to tell us about how grateful they were for our help. "This was a rowing trip and all went well. Except toward the end of the trip our ice reserves were running low. We were very surprised and pleased when one of your boats just showed up and gave us a bunch of ice. 10 blocks. Wow! Those men of yours could not have been more friendly and neighborly! Kudos to you and your fine staff." A Hatch trip was in the middle of lunch when they noticed a nearby private trip in distress. Their boat had flipped in Badger Creek Rapid. The caller told us that they were fearful of a serious situation, but our motor rig swooped in to save the passengers that went overboard. For us, these situations are not about heroics or going above and beyond—they are what all good citizens of the river should do. We all look out for each other on the river, because it’s the right thing to do. Practice "Leave No Trace" Ethics—Take only pictures; leave only footprints (and if you happen to spy a piece of food or trash someone missed, take that with you, too). Be Kind—To people on your trip and to others you encounter. Help everyone enjoy the wilderness area you’ve come to visit. Live A Little—Bring you adventure attitude, embrace the dirt, and be open to new experiences; it will make your experience and the ones of those around you that much better!